Today marks the beginning of our fourth week of day rehab. Leah’s new orthotic was delivered on the 22nd, and she is making good progress. We are excited to see the growth she’ll make in the next three weeks. Her tentative discharge date is still January 13th. At that point, she’ll have therapy only twice a week. Our goal is to make it to the gym an additional 3 or 4 days a week to continue building her strength. Her appointment with the cardiologist went well. Her heart looks perfect, no signs of diminished function. Praise God. The pulmonary doctor ordered a test that we will conduct at home to determine if there is still a need for oxygen when using the BPAP. In addition, we will repeat the sleep study in February to make sure her BPAP settings are accurate. Her next MRI is at the end of January, and she is receiving Avastin today. We are praying that this new year will be a year of continued healing for Leah. Thank you to everyone who ordered the new Brave Strong Girl shirts! We raised more than $3600 for St. Baldrick’s and pediatric cancer research. At the request of a few friends, we relaunched the fund. If you still need to order a shirt, here’s the new link. The last day to order is January 2nd. Leah finished her first week of rehab. It was a challenge, to say the least. Please continue to pray for her strength. The tentative end date is January 13th. At that point she will transition to regular physical therapy and occupational therapy- likely 2 or three days a week. The team meets weekly to assess Leah’s progress, and if needed, the end date will be adjusted. On Thursday, she will be measured for an orthotic that will help stabilize her left leg. As she becomes stronger, the orthotic will be broken down to provide less support. We are hoping it will be delivered prior to Christmas. This week, we had a chair lift installed, so Leah has access to a shower and her bedroom. Life feels so much more normal, having the ability to be upstairs. This week, we also have an appointment with plastics and cardiology. Plastics will simply check on the progress of her previous lip injury. And I’m happy to report its healing beautifully… At some point, Leah will have the option to have it fixed up a little, but that will be much later and only by her choice. Cardiology followed her closely in the hospital, and I expect the appointment to be a routine follow-up. Tuesday evening, we have an appointment with Dr. Nemeh. This is the doctor we saw immediately following Leah’s diagnosis in December 2012. After Dr. Nemeh prayed for Leah the very first time, we received a call the next day that Leah’s original diagnosis of aggressive, grade 4 brain cancer was incorrect. Since then, we’ve had one additional office visit and attended a healing service. It is very hard to get an appointment with Dr. Nemeh, and we feel very blessed to have this opportunity. 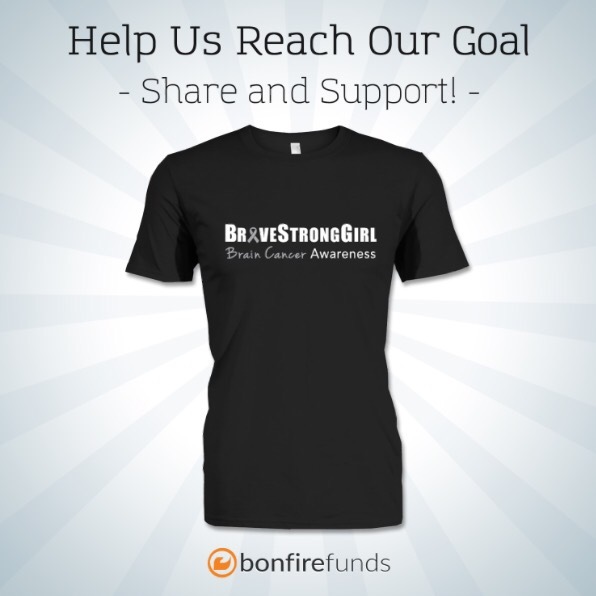 Just a reminder that the Brave Strong Girl t-shirt campaign ends in 6 days. Here is a picture and link so you can share the campaign on social media. Leah starts day rehab on Monday. We will be at the hospital 5-6 hours a day. If her labs look good, she’ll also have chemo on Monday. She looks and feels great. Every time I see her sweet, beautiful smile, my heart just melts. Feeling very blessed. We’ll follow up with several different doctors this month. There is also a nurse practitioner that she’ll see every day at rehab. The results were good. Less swelling than in the November images. The area that appeared damaged from radiation, has not changed. This lack of change supports the fact that this area has indeed been damaged from the radiation, and it is not tumor progression (as Boston suspected). Leah’s overall improvement is also evidence against tumor progression. Leah will continue to receive Avastin every three weeks as her kidneys tolerate it. There will be another MRI in two months. Please continue to pray for complete healing for Leah. Her body has been through so much and has a lot of healing to do. We are able to start day rehab on Monday, so we will be discharged tomorrow pending everything goes smoothly with our home BPAP this evening. The medical company delivered it this morning. For day rehab, we will be at the hospital 5-6 hours a day, but staying at home. They will assess her progress weekly. I’m expecting she’ll be in day rehab for several weeks. We are so happy that we will be able to continue her therapy while staying at home. Of course, it comes with a little bit of nervousness too. She has an appointment with the oncologist on Monday. We will have labs before rehab, and if the numbers look good, chemo after rehab. I suspect pulminology will follow her closely as well.